Hildegard of Bingen was born in 1098, and she was one of the most remarkable and influential women of her time. 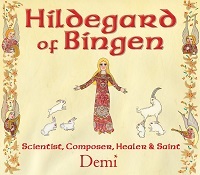 Blessed with an astonishing array of talents, Hildegard was a mystic, theologian, scientist, doctor, nutritionist, composer, writer, linguist, and artist. Popes and kings, as well as humble peasants, sought her wise counsel. Today, Hildegard of Bingen is recognized as a saint and doctor by the Catholic Church and is revered by many Lutherans and other Protestants. Find out more about her life in this beautifully illustrated book by award-winning author, Demi.